Dream, Create, Inspire: Only 12 More Days! I can't believe it's only 12 more days until our little girl gets married! And I am not at all ready....what else is new, huh? There's still so much to do! I realize that all these months leading up to the big day there really isn't a lot you can do, because everything that needs to be done all has to be done at the last minute. Yikes...I wonder if we'll have everything ready in time? 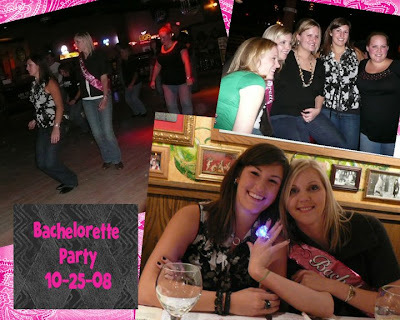 Saturday her friends threw her a bachelorette party (that's our little girl wearing the huge light up diamond ring and "bachelorette" sash!) at Buca di Beppo Italian Restaurant and then on to Sundance Saloon for a night of country music and line-dancing. I made this little card to go with my gift from a vintage lingerie advertisement I found online. Lot's of hot pink and black seemed to be the colors of the evening. Ah, to be young again. . . . .
eekkk it's coming up so fast. love the card!! just my style. No Tricks - Just Treats!